What Events Led Up To The Arrest Of Jesus? Home Jesus The True Easter Story What Events Led Up To The Arrest Of Jesus? The Jewish authorities had been waiting a long time to apprehend and destroy Jesus. Up until this day, their plans had been thwarted. but as you will read, this series of events-beginning with the cleansing of the temple (the Jewish rulers' sacrosanct realm)-was just too much for them to bear. Even so, they made a few more attempts to entrap the Master in lawbreaking in view of the multitudes, all of which failed. But following his "scathing" attack on them in the temple, Jesus' fate was sealed during the final meeting of the Sanhedrin. Even Jesus' proffer of mercy was rejected as they voted unanimously for his arrest and ultimate destruction. EARLY ON THIS Monday morning, by prearrangement, Jesus and the apostles assembled at the home of Simon in Bethany, and after a brief conference they set out for Jerusalem. The twelve were strangely silent as they journeyed on toward the temple; they had not recovered from the experience of the preceding day. They were expectant, fearful, and profoundly affected by a certain feeling of detachment growing out of the Master's sudden change of tactics, coupled with his instruction that they were to engage in no public teaching throughout this Passover week. 173:1.3 But traffic in sacrificial animals and sundry merchandise was not the only way in which the courts of the temple were profaned. At this time there was fostered an extensive system of banking and commercial exchange which was carried on right within the temple precincts. And this all came about in the following manner: During the Asmonean dynasty the Jew coined their own silver money, and it had become the practice to require the temple dues of one-half shekel and all other temple fees to be paid with this Jewish coin. This regulation necessitated that money-changers be licensed to exchange the many sorts of currency in circulation throughout Palestine and other provinces of the Roman Empire for this orthodox shekel of Jewish coining. The temple head tax, payable by all except women, slaves, and minors, was one-half shekel, a coin about the size of a ten-cent piece but twice as thick. 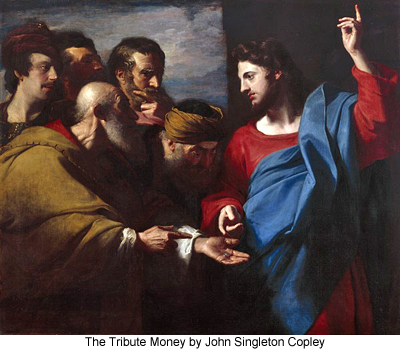 By the times of Jesus the priests had also been exempted from the payment of temple dues. Accordingly, from the 15th to the 25th of the month preceding the Passover, accredited money-changers erected their booths in the principal cities of Palestine for the purpose of providing the Jewish people with proper money to meet the temple dues after they had reached Jerusalem. 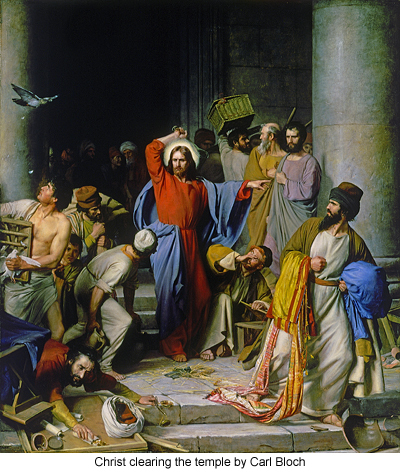 After this ten- day period these money-changers moved on to Jerusalem and proceeded to set up their exchange tables in the courts of the temple. They were permitted to charge the equivalent of from three to four cents commission for the exchange of a coin valued at about ten cents, and in case a coin of larger value was offered for exchange, they were allowed to collect double. Likewise did these temple bankers profit from the exchange of all money intended for the purchase of sacrificial animals and for the payment of vows and the making of offerings. 173:1.6 As Jesus was about to begin his address, two things happened to arrest his attention. At the money table of a near-by exchanger a violent and heated argument had arisen over the alleged overcharging of a Jew from Alexandria, while at the same moment the air was rent by the bellowing of a drove of some one hundred bullocks which was being driven from one section of the animal pens to another. As Jesus paused, silently but thoughtfully contemplating this scene of commerce and confusion, close by he beheld a simple- minded Galilean, a man he had once talked with in Iron, being ridiculed and jostled about by supercilious and would-be superior Judeans; and all of this combined to produce one of those strange and periodic uprisings of indignant emotion in the soul of Jesus. 173:4.2 "There was a good man who was a householder, and he planted a vineyard. He set a hedge about it, dug a pit for the wine press, and built a watchtower for the guards. Then he let this vineyard out to tenants while he went on a long journey into another country. And when the season of the fruits drew near, he sent servants to the tenants to receive his rental. But they took counsel among themselves and refused to give these servants the fruits due their master; instead, they fell upon his servants, beating one, stoning another, and sending the others away empty-handed. And when the householder heard about all this, he sent other and more trusted servants to deal with these wicked tenants, and these they wounded and also treated shamefully. And then the hous eholder sent his favorite servant, his steward, and him they killed. And still, in patience and with forbearance, he dispatched many other servants, but none would they receive. Some they beat, others they killed, and when the householder had been so dealt with, he decided to send his son to deal with these ungrateful tenants, saying to himself, `They may mistreat my servants, but they will surely show respect for my beloved son.' But when these unrepentant and wicked tenants saw the son, they reasoned among themselves: `This is the heir; come, let us kill him and then the inheritance will be ours.' So they laid hold on him, and after casting him out of the vineyard, they killed him. When the lord of that vineyard shall hear how they have rejected and killed his son, what will he do to those ungrateful and wicked tenants?" ABOUT SEVEN O'CLOCK on this Tuesday morning Jesus met the apostles, the women's corps, and some two dozen other prominent disciples at the home of Simon. At this meeting he said farewell to Lazarus, giving him that instruction which led him so soon to flee to Philadelphia in Perea, where he later became connected with the missionary movement having its headquarters in that city. Jesus also said good-bye to the aged Simon, and gave his parting advice to the women's corps, as he never again formally addressed them. 174:0.3 And when he had concluded these greetings, he departed for Jerusalem with Andrew, Peter, James, and John, as the other apostles set about the establishment of the Gethsemane camp, where they were to go that night, and where they made their headquarters for the remainder of the Master's life in the flesh. About halfway down the slope of Olivet Jesus paused and visited more than an hour with the four apostles. 174:5.3 "My Father sent me to this world to reveal his loving- kindness to the children of men, but those to whom I first came have refused to receive me. True, indeed, many of you have believed my gospel for yourselves, but the children of Abraham and their leaders are about to reject me, and in so doing they will reject Him who sent me. I have freely proclaimed the gospel of salvation to this people; I have told them of sonship with joy, liberty, and life more abundant in the spirit. My Father has done many wonderful works among these fear-ridden sons of men. But truly did the Prophet Isaiah refer to this people when he wrote: `Lord, who has believed our teachings? And to whom has the Lord been revealed?' Truly have the leaders of my people deliberately blinded their eyes that they see not, and hardened their hearts lest they believe and be saved. All these years have I sought to heal them of their unbelief that they might be recipients of the Father's eternal salvation. I know that not all have failed me; some of you have indeed believed my message. In this room now are a full score of men who were once members of the Sanhedrin, or who were high in the councils of the nation, albeit even some of you still shrink from open confession of the truth lest they cast you out of the synagogue, Some of you are tempted to love the glory of men more than the glory of God. But I am constrained to show forbearance since I fear for the safety and loyalty of even some of those who have been so long near me, and who have lived so close by my side. SHORTLY AFTER TWO o'clock on this Tuesday afternoon, Jesus, accompanied by eleven apostles, Joseph of Arimathea, the thirty Greeks, and certain other disciples, arrived at the temple and began the delivery of his last address in the courts of the sacred edifice. This discourse was intended to be his last appeal to the Jewish people and the final indictment of his vehement enemies and would-be destroyers—the scribes, Pharisees, Sadducees and the chief rulers of Israel. Throughout the forenoon the various groups had had an opportunity to question Jesus; this afternoon no one asked him a question. 175:1.5 "As long as there is a chance that the Jews will turn to my Father and seek salvation, the God of Abraham, Isaac, and Jacob will keep his hands of mercy outstretched toward you; but when you have once filled up your cup of impenitence, and when once you have finally rejected my Father's mercy, this nation will be left to its own counsels, and it shall speedily come to an inglorious end. This people was called to become the light of the world, to show forth the spiritual glory of a God-knowing race, but you have so far departed from the fulfillment of your divine privileges that your leaders are about to commit the supreme folly of all the ages in that they are on the verge of finally rejecting the gift of God to all men and for all ages—the revelation of the love of the Father in heaven for all his creatures on earth. 175:1.7 "My Father has long worked for your salvation, and I came down to live among you and personally show you the way. 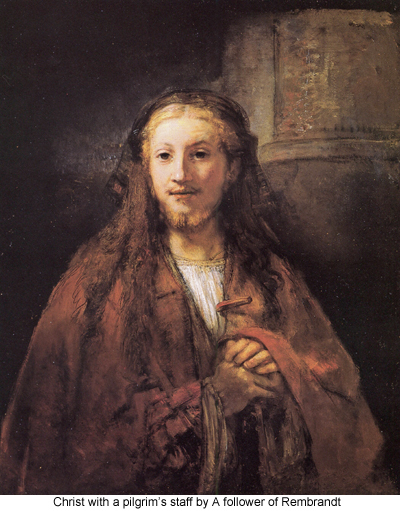 Many of both the Jews and the Samaritans, and even the gentiles, have believed the gospel of the kingdom, but those who should be first to come forward and accept the light of heaven have steadfastly refused to believe the revelation of the truth of God—God revealed in man and man uplifted to God. 175:1.17 "Woe upon you, scribes and Pharisees and all other hypocrites who make sure that they tithe mint, anise, and cumin and at the same time disregard the weightier matters of the law—faith, mercy, and judgment! Within reason, the one you ought to have done but not to have left the other undone. You are truly blind guides and dumb teachers; you strain out the gnat and swallow the camel. 175:1.20 "Woe upon you, false guides of a nation! Over yonder have you built a monument to the martyred prophets of old, while you plot to destroy him of whom they spoke. You garnish the tombs of the righteous and flatter yourselves that, had you lived in the days of your fathers, you would not have killed the prophets; and then in the face of such self- righteous thinking you make ready to slay him of whom the prophets spoke, the Son of Man. Inasmuch as you do these things, are you witness to yourselves that you are the wicked sons of them who slew the prophets. Go on, then, and fill up the cup of your condemnation to the full!